Members of the Infinibotics team developing an autonomous robotic toy car as an educational tool include, from left to right: Edward Andert; team mentor Aviral Shrivastava; Roger Dolan; and Bryce Holton. A robotic toy car first developed as a class project is now the basis of a business startup by a group of Arizona State University engineering students. They’re designing Cosmo – the car’s name – as a tool for teaching pre-school-age children basic math and spelling through games programmed into the robot’s software. The venture, called Infinibotics, recently got a boost by winning support through the ASU Venture Catalyst program’s Edson Student Entrepreneur Initiative. The Cosmo team will receive some funding, along with business mentoring and office space during the 2013-2014 academic year. The team includes computer systems engineering graduate students Edward Andert and Roger Dolan, computer science graduate students Shang Wang and Bryce Holton, and mechanical engineering senior Austin Deveny. Their faculty adviser is Aviral Shrivastava, an associate professor in the School of Computing, Informatics, and Decision Systems Engineering, one of ASU’s Ira A. Fulton Schools of Engineering. Infinibotics stems from an idea Shrivastava came up with two years ago to teach students in one of his senior capstone engineering design courses to apply basic computer systems engineering design principles to producing a robotic toy car. Using image-processing algorithms, the students were first instructed to follow a person walking so they could understand the mechanics of what they wanted to enable the vehicle to do. 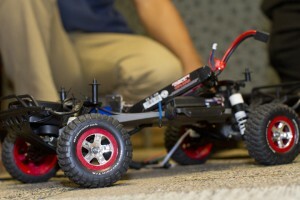 Cosmo, the toy robotic car being developed by a team of ASU engineering students, can follow simple voice commands. Students in the first class to undertake the project assembled the necessary components to make the car work. Another class developed the computer software for detection and tracking, enabling the car to follow behind someone as they walked. Eventually, the remote-controlled vehicle could be directed to outmaneuver darts shot from a toy turret. The students showcased the robot car at ASU’s annual Engineering Open House last spring and found that “children were loving the toy,” Cosmo team member Andert says. One father asked if he could buy the toy vehicle for his son. When Shrivastava’s five-year-old daughter, Lehka, played with the toy, she asked her father if the car could be made to stop when she told it to, and if it could play spelling games with her. Her questions and feedback from others who saw the robot at the open house sparked a new phase of the project – developing the robot car as an educational toy for children. The Infinibotics team that formed to turn the project into a product is designing the next Cosmo prototype to provide more interactive features. Ideas include enabling the robot toy to play hide-and-seek and treasure-hunt games that present simple math and spelling challenges. After that the team will face manufacturing and marketing challenges. But winning support from the Edson Student Entrepreneur Initiative is a confidence builder, team member Holton says.